• How do you evaluate the clinical usefulness and the benefit to patients? Should physicians or clinical laboratories provide genomic information that has no medical importance but is of social or personal consequence to the child (e.g., genes associated with athletic or musical ability)? 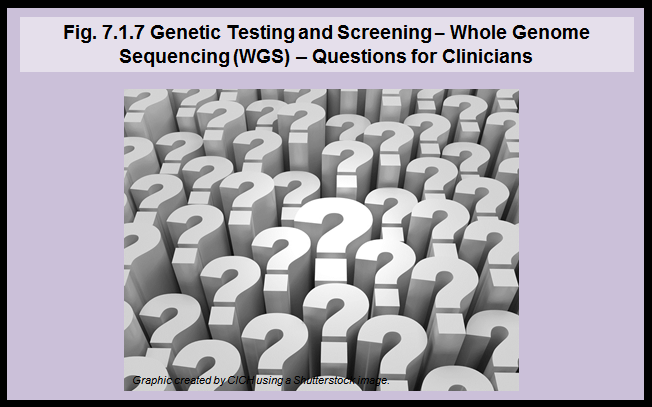 • Does whole genome sequencing require a different level of consent than other genetic tests or medical assessments? • Should patients be informed of results that do not have direct implications for them but do for other family members? • Should other family members be informed of findings that have direct implications for them that were found on analysis of a relative’s genome sequence? • Do physicians or clinical laboratories have a duty to re-contact patients if sequence data that were previously obtained are later found to have serious medical implications?